Post your unit reviews here. They will be linked in this first post for easy access. 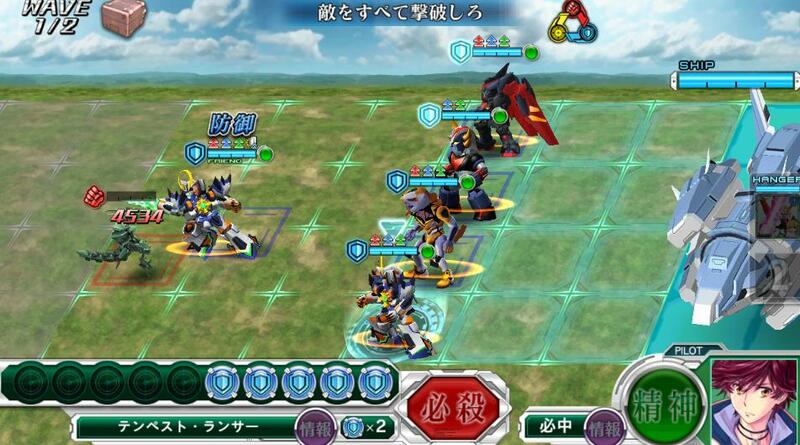 Arios is the 3rd short range shooter to be added to the game, those units tend to have attacker speed on regular attacks to make up for the short range, and tend to have more mobility than usual for shooters, its a new type of unit that requires actual a nice setting to work. Arios Hisatu is GN Twin Bean Rifle, its interesting since it applies slow on a medium change, the modifier of the hisatsu its 450% the unit base attack. and i can't make the breakdown detailed on the dmg since i don't saw how much the dmg grow, Alelujah is a unit that you want to use on to shoot multiple enemies on a lane to make them slow and gain time, slown is a great status effect, since the enemies won't reach your units, hence don't attack. Guts ~ this one is great and help him survive on the field, OO Raiser have a problem to survive a lot, you need to take care, Arios can use guts to reposition himself when being swarmed. Hot Blood ~ good for increase the dmg output of his hisatsu if you only have him as your SSR dependable shooter, otherwise take Focus or Guts. Brain quantum wave - ok this is a nerf TERADA why u no super soldier?, this skill its here to replace super soldier, and its a large evade up, and a accuracy up, its quite good and a good kit with Focus, however Super soldier would do wonders for this unit, but working with what we have, we have a new support coin to increase evasion, so one can say that Arios thing is sorta off dodge tank. man are you people seeing Game of thrones? its nuts garls and boys nuts!!! Actually, I haven't seen you showed up on my friend summon for awhile, Mai. I'll be online for the next ... 12 hours I believe. The problem of having too many friends is, that sometimes people we want got drowned from the list. We do only have 15 last logged friends on the top afterall (+5 random people). Plus, you're usually sleeping in about 3 hours from now. 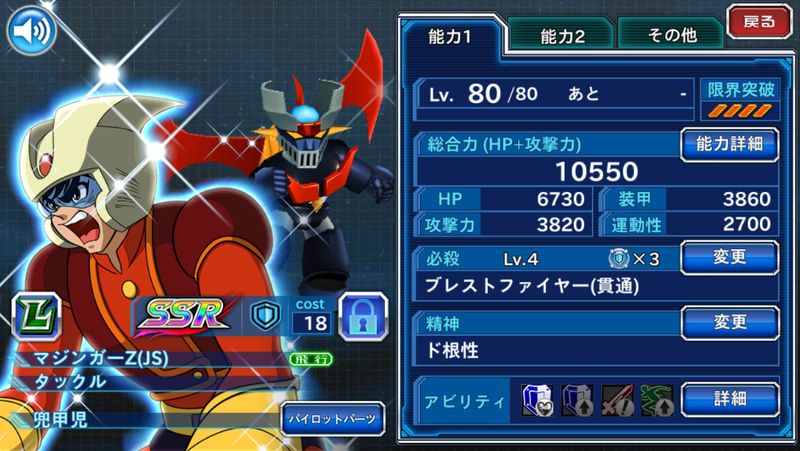 Having a incredible power output and pretty high stats, a little thing annoyed me when i received the first copy of him, his cost its too low, he is too strong and his cost its only 19, compared to 26 of Mazinkaiser and for me that didn't really make sense, Mazinkaiser was harder to get (i only got one).. them i began to play this unit and discovered the reason for this. in fact Granteed misses almost 50% of his attacks on units with high mobility or shorter units than himself, if he is underleveled he has problems even hitting super enemies, it don't meter how many dmg Touya can do if he can't hit, but when he hits, he hits pretty hard. notice that this is a attacker enemy and has type advantage if is was a shooter that damage would have surpassed 6k, however before this attack connects he missed 4 on a row, meaning that our regular defenders would have done more damage than him on that time. Lock on ~ you will need this one, its probably his better one, he misses too much without this, but with this on he becomes a machine of destruction, that can clean one wave for your team. 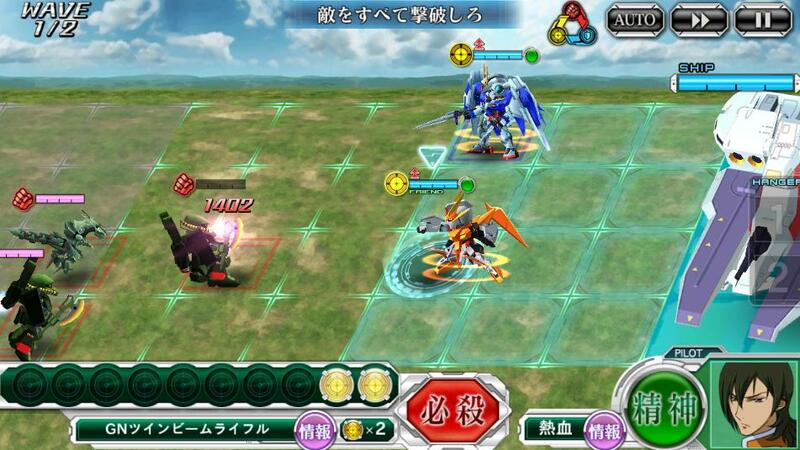 Attack Determination ~ this skill does a large increase in power in trade of a Overlarge decrease in hit rate. using this you can bypass the penalty and make him hit, however it all comes with its price, Lacus its not exactly the better captain of the game, and her skill will only help a little set of units, and you have to forget Archangel Dodge bonus, or Argama attack bonus, or the defense bonus of other ships. 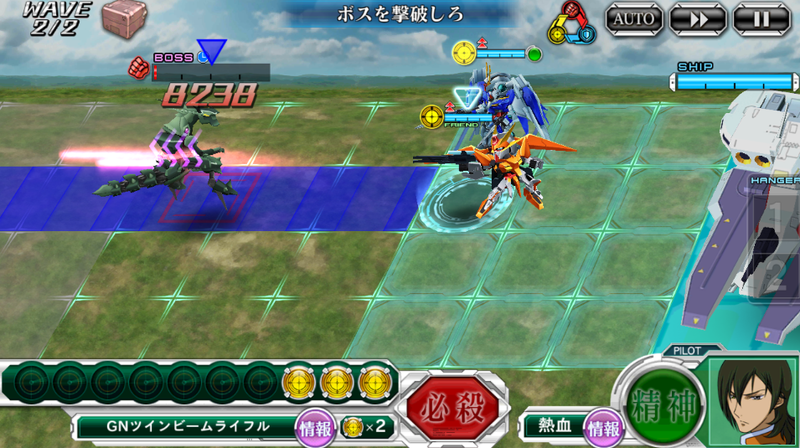 to make it safer if you have Seraphim Gundam you can deploy it, it also raises all the units hit rate by 10% them it will leave it at 80% that' the maximum that this unit can reach actually. 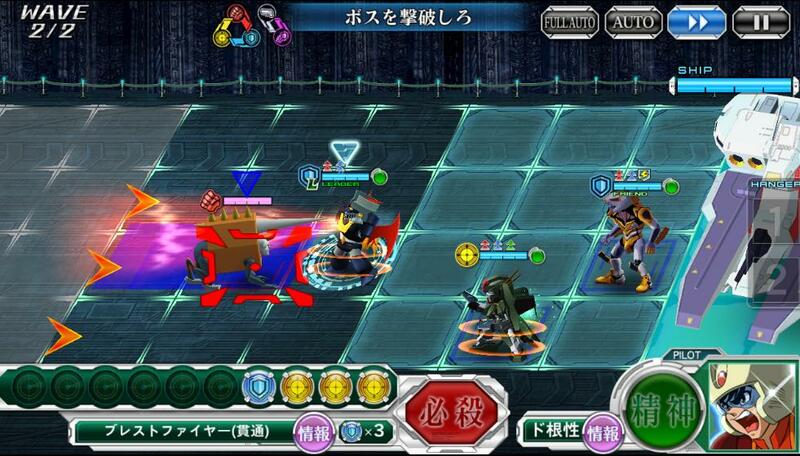 Guard Up ~ To balance the first skill, we have that, sometimes Touya will negate totally the dmg of a attack guarding it, the symbol "block" will appear then this happens and the unit will suffer ridiculous low dmg or no dmg at all. so here we have it, its a unit that requires set up, or you can deploy him only against supers, or underleveled enemies, or do the setup and get the most out of him, its worth, he carried me on the lvl 90 mission after all. Not only the first unit to receive its leader skill, but also the first unit to receive voice, not bad huh? 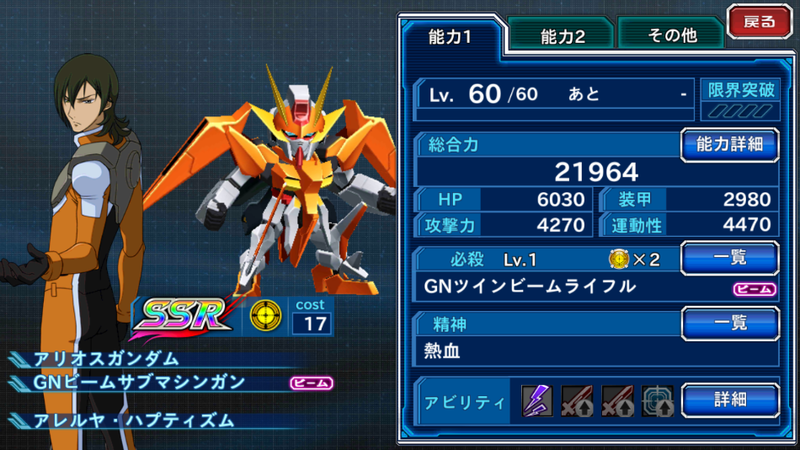 this Mazinger was gifted by the update on a twitter campaign and its a unit that everyone have, as a SRW icon i think its was nice of them, but does Kouji do his job? This unit its build totally around defense, and it will stay alive a long time, it has a pretty big armor and its seishins to keep it alive such as "guts", the cost its not so high, definitively i can see this unit being played for a long time. 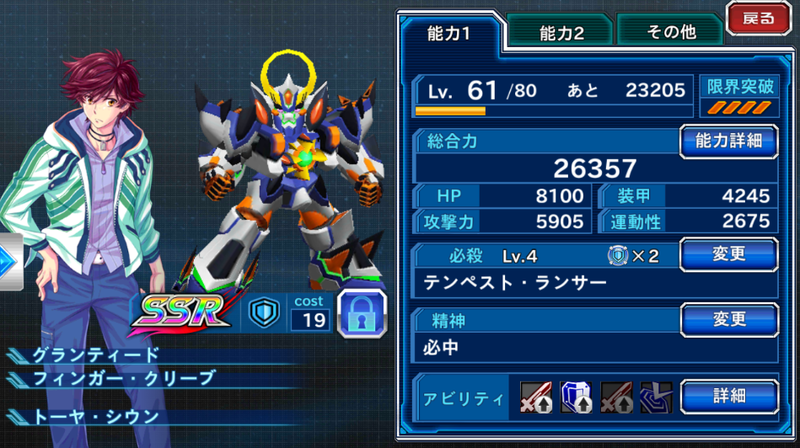 so we have a kit based on tanking damage, Mazinger thing is take dmg and don't die, do some dmg overtime while your other allies finish the enemy he is quite good for that, the dmg output of this unit its quite low have this in mind when using him, its not made to explode thins, just stall. 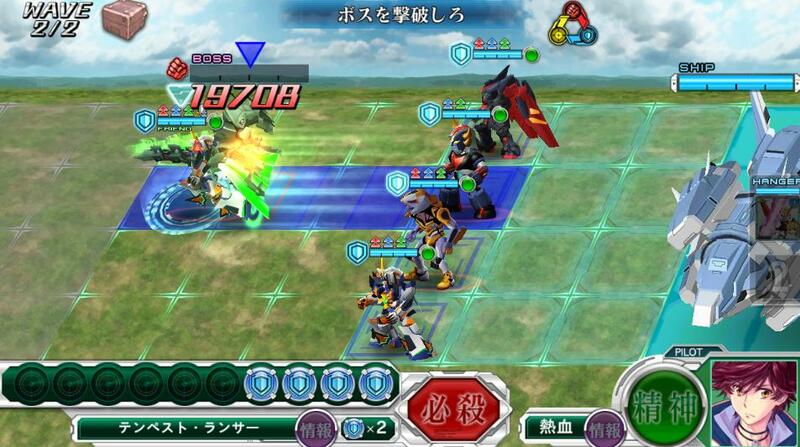 Jet Scramble Dash ~ Large movement speed up. a overall decent unit that i think that will see play on the future due to the lack of easy to acquire defenders, and i don't really like defenders that does dmg and have little hp or some other problem for their dmg output, its a reliable unit, not top tier of the defenders but a good one on times of need. First of all i will tell you people one thing, and be with this in mind if you're using this base gatcha, if you have Lelouch and C.C. old Gawain, think if you really want to do this pull i talked before about not pulling on this before testing the units, but well i used the base gatcha, as its not as bad as it believed it would be, however have all this review in mind before trying for C.C. C.C won't really gain the nobel prize on normal attacks, Gawain attacks are very slow for a attacker unit, and the dodge rate of the units its not really awesome as well. another thing that i noticed its that she has A Rank on water, all the event units have A rank on water, this is a improvement a big one, because you can use the slot to equip another part. have in mind that she is a great unit to have around for her passives. Her Hisatsus are the same ones that Lelouch have. Druid System (2 Cores) ~ Reduce attack of the enemies on area. 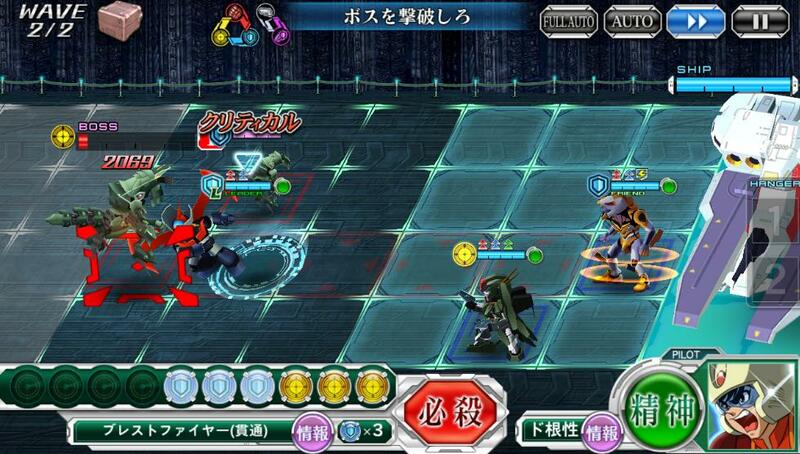 ok i will go straight this does NO dmg, if you never played Lelouch, this thing is a debuff, mostly used to stall for time, to recover someone on the battleship, or survive a wave of enemies when they come like flies, it also count as a debuff so you know all the units that receive bonus on dmg because of it can do great dmg on debuffed units. while the range is great this hisatsu is costly and it don't do a lot of dmg its just regular dmg, mostly used as a wave clear than anything else, Gawain is a very old unit after all and his hisatsus received no update for C.C. , but them again you won't be using her as your main attacker. Soul ~~ to help her wave clear, she really need this if you plan to use her on high level content or you won't be doing much. and here is the fun thing about C.C. her passives are very good with a little downside...., she don't have the barrier, yeah you read it right, her boss version have it, but her playable version don't have the barrier that Lelouch unit have and it helps him survive a lot. ok this one is pretty nice, it has a hit rate up and raise attack of all types of the game, this passive its one of the best things that this unit has to offer. this means that the simple fact that having C.C. on your party buff all of your units by the bare minimum of 7/10% if they are attackers 15%, she is the only commander in the game capable of buff status of Blasters and Fighters. and that's it while a weak unit on her own C.C. has numerous buffs to keep her valuable on the field, however this is a unit that needs various strong units around her to keep things going, she would be a of great help on conquest mode for example. Summer reviews episode two ~ it toke her a yer, but she did it. Yes Kallen is back, yet another one, more naked this time, and better than the previous one as well, before anything you should notice one thing, Summer Kallen cost its awesome for a SSR, she cost only 16, for a comparative effect her SR attacker version costs 13 to deploy, this give us more options to make teams and that's great. She is a regular long attack shooter, and not a close ranged one, so you can use this for the regular shooter Guren to some extent. 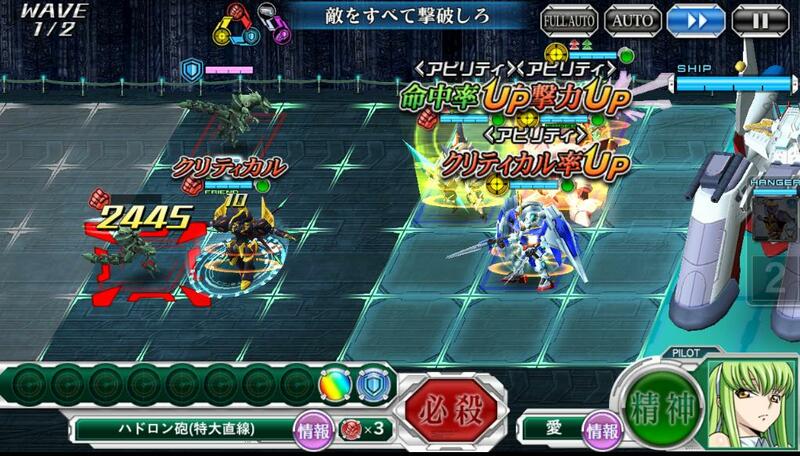 her normal attacks are the same as her other version, and her status are only sightly higher as well. Radiation Wave: Large damage against a single enemy on range and also penetrate barriers. how much i hated this hisatsu on the original version of her before the buffs, it was bad, she dashed on the enemy field explode a enemy and sometimes stayed there shooting close range to be swarmed by enemies or other times doing nothing,sometimes she tried to return but since her unit was so slow on some terrains it toke a eternity. with the new Kallen it don't happen a lot since she now moves a lot faster its also good to notice that Large dmg (400/800% modifier varies with skills in use) that break barriers are very rare i believe that only her and Mwu large dmg and also break barriers. the problem is... there's no way to make her hit two enemies in a single attack, you will always hit one, so use this only as a finisher, its a single target focused mini nuke,you still have to make her retreat back to the backlines after the attack, so be sure to only use this when you know that the enemy will explode or when you have enough time to reposition your unit. Guts ~ Large hp heal, this is quite good on her, her unit don't have a lot of HP and all versions of Kallen use this seishin a lot a least i like to use it a lot, it provides her more staying power in hard battles, now it might not be much of a issue since you can build a setup to try to doge stuff. 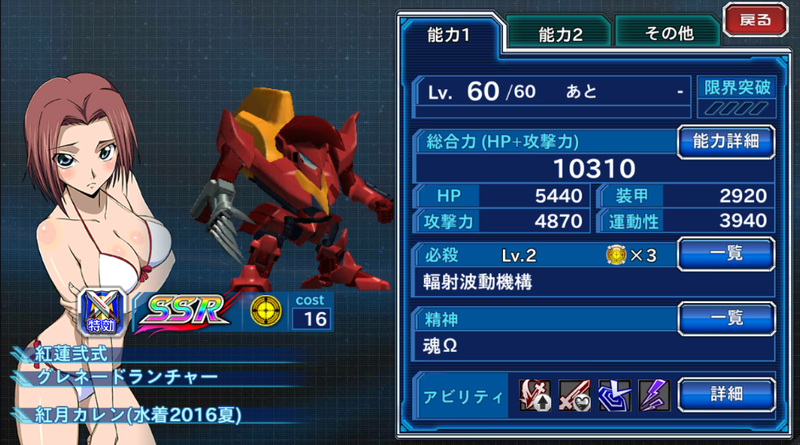 Iron Wall ~ Reduce all the dmg taken for a period of time, its a medium reduce of damage and i don't know the multiplier but if its like the super robot ones, its quite efficient, as its in all SRW games Kallen has a super robot pilot seishins. - Radiation Barrier ~ reduce dmg against all attributes, i like barriers, you like barriers, everyone likes them, reals with barriers are awesome, reals with dodge skills and barriers are pretty awesome, and you can abuse this here if you try, on this event we have a C.C. coin that raises evade by a lot for example. - Midsummer Coquettish ~ Kallen normal attacks blow enemies back a little, this is a normal thing for Blasters but not a normal thing on other shooters, and that's great, you can use it to stall time on bosses, if they're attackers/fighetrs or Blasters obviously, sometimes if a unit its already very close to Kallen it don't work for some reason, but most of the time it does. 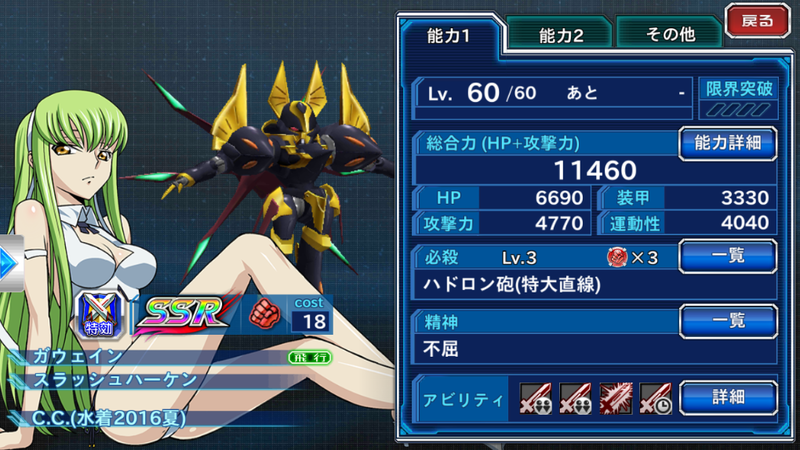 and the code geass units are done. Bet you didn't know that Hisatsus could crit huh? 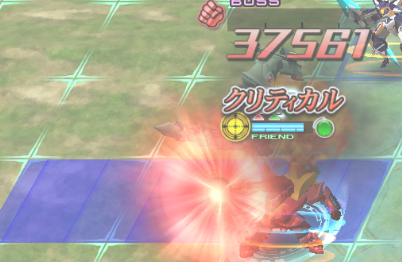 that's Kallen's dmg on that thing with no soul, like i said it hurts. Current time: 04-24-2019, 01:55 PM Powered By MyBB, © 2002-2019 MyBB Group.